To think or Design Think? I left home that morning with a strange feeling of uncertainty. I was heading to the Design Thinking mastercourse given by Katja Tschimmel and Mariana Valenca. No, it was not Thinking I felt uncomfortable with. It was Design. What design today means to me are mostly UML charts and lines of software code. Oh dear, will I actually need to create some art in the class? Katja carefully introduced us to Design Thinking. What a relief! It is not about putting highly artistic views of the world on the paper! It is about structured process that designers use on a daily basis to come up with all kinds of beautiful artifacts (Tschimmel, Katja 2012). The structure, process and innovation resonated very strongly in my mind. Design Thinking is meant for everyone, not only for a selected crowd with specialized designer talents. It is something that escaped from the designers’ world and found its way in many other disciplines. Wonderful! 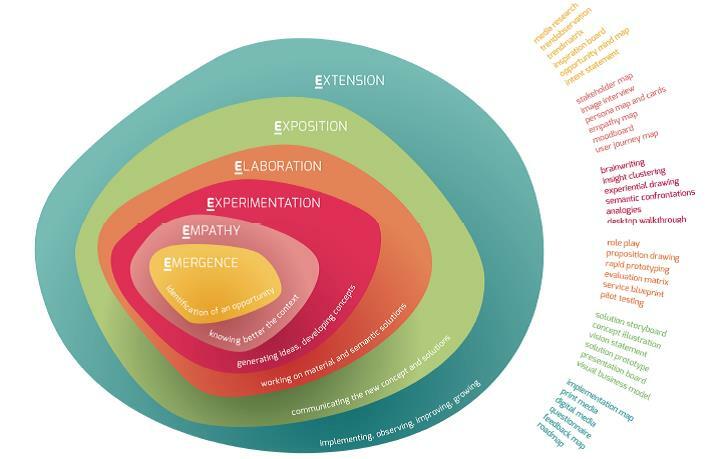 And there are a number of approaches that can be used, from IDEO’s 3 (Inspiration, Ideation, Implementation) model, over British Council’s Double Diamond to Mindshake’s very own Evolution 62. It all starts with a topic, a deadline and a team of open minded people. A topic, because it is difficult to solve the whole world at once, and focus is clearly required. A deadline, or the “the project” (Brown, Tim 2009), because time (or actually lack of it) is what gives us the necessary sense of urgency. And open minded or T-shaped people, since the best ideas are born at the intersections between disciplines (Brown, Tim 2009). And then starts divergence. The team draws a mindmap around the topic, with not too many but not too few levels either. The mindmap is enriched with sketches. Team members use the drawing board to work in parallel and build on top of each others’ ideas (Brown, Tim 2009). Stakeholder map helps as well to discover hidden relationships between actors and roles and dive deeper into the context (Tschimmel, Katja 2012). And there are plenty of other methods out there, if the team feels it will bring new insights at that very moment (Tschimmel, Katja 2012). Each of the methods projects the topic onto different set of dimensions and look at the topic from the different perspectives. The team looks at the mindmap and all the edges that unfolded. They try connecting and associating edges that have not been connected before. They explore as many combinations and what comes out of them. They use their intuition. They draw sketches. They are brave and bold. It really is about connecting the unconnected dots. Finally they select one idea and make it into the intent statement. At this point it is good to catch a breath. The idea popped up but is it appealing enough for the users? There is no better way than, well, to ask users themselves. Be the answer “Yes”, “No”, or “Hmm, maybe”, it helps the team to adjust the idea based on the feedback. Insight board also helps to get a big picture of the response to the idea. Sometimes it takes a complete U-turn to get back on track. And that is completely OK. There is nothing wrong in admitting that things went wrong. Trying and failing fast is crucial in the design thinking process (Brown, Tim 2009)! Backed up with new insights the team goes into brainwriting. They diverge again, in a spiritual silence, letting their brains say what they have to say, without disrupting others, building on each others’ ideas. They cluster the ideas, fill out gaps, and let the hottest ideas pop up to the top. Some post-its simply gravitate to each other, and the final concept magically unfolds in front of their eyes. The great time for another moment of truth. Making a concept prototype helps the team understand the beautiful monster that they just came up with. It gives color, look, feel and even fragrance to the idea. The team then transforms itself into a set of theater experts and makes a roleplay to the peers and customers. Again, the moments of truth and reality hit them when they receive feedback, but they know more and adjust. … To land at a concept! Summarizing the idea into a storyboard or business model canvas projects the idea into a standardized, recognizable and easy-to-explain form. As usual, each of the methods projects the idea onto a different set of dimensions. This helps to pitch the concepts to peers and stakeholders. To frantically defend it and fight for it. Do not get me wrong, but the team has all rights to do it. At this stage they are confident the idea is going to save the world. The end result of their work is often mind-blowing, with digital and physical world seamlessly coexisting to save the earth resources and improve human life. And it takes a lot of skill to convince everyone in tiny few minutes. The designers are offering us a hand called Design Thinking. Let’s grab it! Who knows, we may ourselves end up with something as amazing as Piano Stairs. 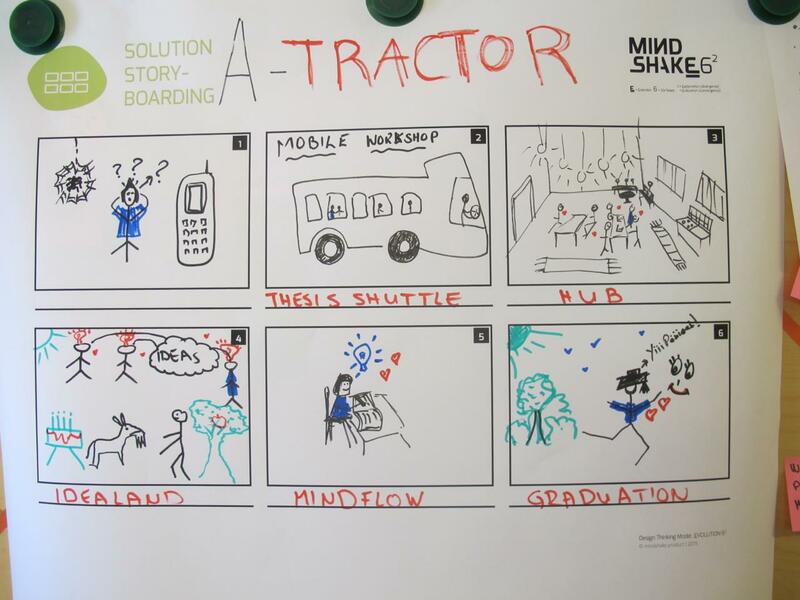 Very good reflection of the Design Thinking process Nenad! I really liked the way you had sectioned your text with the several headlines – it was easy to follow and really took the reader along to experience the process through the text.